The Fate of the World Changed in Paris—but by How Much? EDITOR’S NOTE: This article has been updated to reflect the author’s further reflections after the end of the summit. Thanks a lot, Republicans. You weren’t in Paris physically, but you still managed to grievously weaken the landmark agreement reached at the global climate summit. On one hand, it is amazing and inspiring that virtually all the world’s governments approved a plan to address an existential collective threat by pledging to leave behind the fossil fuels that are the foundation of modern economies and are controlled by some of the most powerful corporations and nation-states in history. Naming 1.5 degrees Celsius as a goal for the eventual maximum temperature rise was a stunning diplomatic victory for the world’s poor and vulnerable countries. And people of all nations will now take heart that meaningful climate action is possible, which will lend further momentum to the proceedings. Nevertheless, on both scientific and humanitarian grounds, Democratic presidential candidate Bernie Sanders is correct to say that the Paris agreement “goes nowhere near far enough.” And the main reason it doesn’t is his GOP colleagues in the Senate, which would have had to ratify a bona fide treaty. This is part of a reported series on the 2015 United Nations Climate Change Conference. But the celebratory tone coming out of Paris overlooks how lethal this agreement will be for huge masses of people in the Global South. It also skips past just how far short the accord falls from what science demands. Even if the largely voluntary provisions of the Paris agreement are fully implemented, tens of millions of people in poor and vulnerable regions such as Bangladesh, the Marshall Islands, and much of Africa and Asia are being doomed to homelessness, impoverishment, and death, with today’s children predicted to bear the brunt of the suffering. That such a distressing future is applauded as success in the Global North only reminds us how tragic—indeed, criminal—it is that fossil-fuel interests and the politicians they buy have blocked serious climate action for the past two decades. The best way to lower the death toll and improve civilization’s future prospects is for civil society all over the world—climate-justice advocates, community and religious leaders, business and financial executives—to push harder than ever to turn the noble but nonbinding aspirations declared in Paris into rapid, concrete transformations of our energy, agriculture, consumerist, and other socioeconomic systems. The Paris agreement can help us build a better future, but only if the resistance of the old order—as personified by the climate deniers in Congress and their paymasters in the fossil-fuel industry—is routed once and for all. The world changed in Paris, but it is crucial to be clear about how much. Setting a temperature goal of 1.5 to 2 degrees Celsius foreshadows a massive potential shift in the global economy. If governments, businesses, investors, and organized consumers around the world take fast action commensurate with that goal, as green leaders like Germany and California have begun to do, it could indeed spell the end of the fossil-fuel era. The key words, however, are “if” and “fast.” Here, the Paris agreement again bows to the obstinance of Republicans. Governments are not required to reduce heat-trapping emissions by a single molecule, much less by a scientifically appropriate amount; they are only required to publicly declare how much and how soon they intend to make reductions and then report them transparently after the fact. Nor need these voluntary reductions begin until 2020, thereby inviting five more years of digging our global climate hole still deeper before changing course—a calamitous choice. “Do not wait another day” to shift to clean-energy sources: While it’s easy to dismiss celebrities who speak out on the issues of the day, the actor Leonardo DiCaprio got it exactly right when he delivered this plea to a gathering of mayors, governors, and other “sub-national” officials on the sidelines of the Paris summit. Waiting until 2020 to cut emissions invites disaster. If humanity wants a decent chance at hitting the 1.5°C target—which is essential for the survival of millions of people and of such sensitive ecosystems as coral reefs, which are a foundation of the marine food chain that provides many of the world’s poor with much of the protein in their diets—emissions must peak by 2020, scientists say, not merely increase more slowly, as the Paris agreement envisions. Peaking by 2020 is also critical for the earth’s snow and ice cover. Polar ice sheets are already melting at a terrifying rate; lose Greenland and Antarctica, and we will unleash an eventual 220 feet of sea-level rise, dooming our descendants. We can build a better future, but only if the resistance of the old order is routed once and for all. The Paris agreement almost certainly would have been stronger if the Obama administration had not been constrained by GOP hostility to fighting man-made climate change. Secretary of State John Kerry admitted as much to fellow negotiators. “He said he wished that we could include specific dates and figures for emissions cuts and financial aid [to help developing countries adapt to climate impacts and choose clean over dirty energy], but he explained that this could trigger a review by the US Senate that could scuttle the entire agreement,” a delegate from a Mediterranean country told The Nation, requesting anonymity because his government is a US ally. The big question after Paris is whether the agreement, despite the weaknesses imposed by congressional Republicans (and others—Saudi Arabia was no angel), will send a sufficiently strong signal that world leaders will start making fundamentally different choices more or less right away. Al Gore, who in recent years has transitioned from the public to the private sector, is unabashedly optimistic. “This universal and ambitious agreement sends a clear signal to governments, businesses, and investors everywhere: the transformation of our global economy from one fueled by dirty energy to one fueled by sustainable economic growth is now firmly and inevitably under way,” Gore said. The smart money was already moving in this direction before Paris. The plummeting costs of solar, wind, and other renewables were one motivation. Another was the growing drumbeat of warnings, from such impeccably establishment voices as the International Energy Agency and the governor of the Bank of England, that the vast majority of the earth’s remaining fossil fuels must be left in the ground to honor the 2°C target, raising the risk of trillions of dollars in stranded assets. Including the 1.5°C target in the Paris agreement ups the ante considerably. Hitting the 2°C target requires getting the entire world economy off fossil fuels by roughly 2050, an all-star panel of climate scientists explained at the summit, but hitting 1.5°C accelerates that schedule by a decade or two. This means that not only coal, but also oil and gas, must be left behind, and sooner than almost anyone imagined. Thus, 1.5 °C amounts to a death sentence for the global petroleum complex as currently operated. It is only logical, then, that companies like Exxon- Mobil and Chevron, and petro-states like Saudi Arabia and Russia, will fight to the death to avoid it. It is tragic, indeed criminal, that fossil fuel interests have blocked climate action for the past two decades. Perhaps the most encouraging, and game-changing, development in the climate struggle in recent years has been the emergence of a mass movement dedicated to climate justice—for all people, all generations (including those yet to come), and all species. Global in scope and vision, local in strength and focus, unswayed by blandishments of insider status or incremental progress, this movement is still often underestimated by the powers that be. 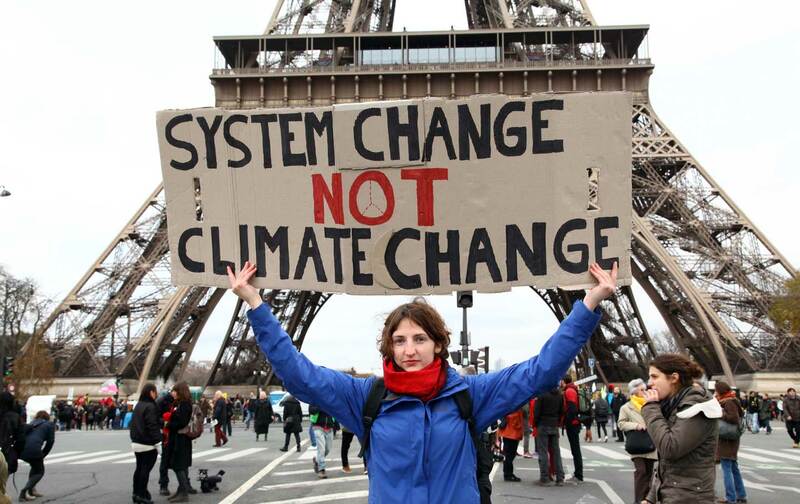 Yet it has accumulated an increasingly impressive string of triumphs, from pushing in the United States until President Obama and Democratic presidential candidate Hillary Clinton finally rejected the Keystone XL pipeline, to surprising nearly the entire international community by lodging the previously dismissed goal of 1.5 °C in the final Paris agreement. More triumphs are needed. The challenges ahead are staggering, and too many innocents will suffer before it’s over. But Paris, and all that made its imperfect but exhilarating result possible, tells us that this struggle is not in vain. Victory is possible. Victory is necessary. And the path to victory is its own reward.